Every year, the Common Admission Test is conducted by one of the 20 IIMs (Indian Institute of Management) to provide admission to various Post Graduate Management Programs such as, PGDM, PGP, PGPEM, PGPPM, EPGPM, PGP-FABM, PGPSM and PGP-ABM which are Equivalent to MBA degree. These 20 IIMs offer more than 4000 seats on the basis of CAT score. The candidates who are willing to apply for CAT 2018 are advised to get ready for tomorrow and keep tracking the official website and newspapers to check CAT Notification 2018. 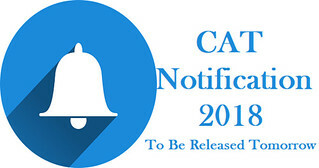 After the release of notification for CAT exam, the candidates will be able to proceed for CAT Registration process which is likely to be started from the second week of August 2018.